SM Contractors Essex Ltd - Driveways/Patios/Paths, Landscaper based in Braintree, Essex. S.M. 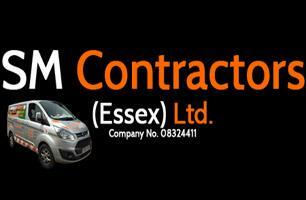 Contractors (Essex) Ltd is a family run business based in Braintree, Essex. We undertake works in all of North Essex, South Suffolk and East Herts on a daily basis. We were incorporated as in limited company in 2012 but have been trading as a family business for over 20 years. We have a skilled, experienced and friendly team undertaking all aspects of hard landscaping and driveways on a daily basis. We have our own machinery and plant so no need to hire in expensive machines or skip hire. We specialise in domestic driveways - skilled in block paving, tarmac, tar and chip and many other finishes. We are also able to design and lay patios in a variety of finishes. Free site surveys with a no obligation quotation. View our photos for recent examples of our work. Exterior Property Maintenance and Repairs. Exterior painting and property repairs. Roofs repaired, cleaned and inspected. UPVC facias soffits and guttering. Pressure washing of drives, patios and decking. Resealing and repairs. Brick work, site clearance and all aspects of exterior property maintenance, repairs or new installs. We have an experienced and professional team with a 'can do' attitude. All works are completed to a high standard and guaranteed. All rubbish and site waste is quickly removed and once we undertake any works we remain on site until the job is done. We are fully insured and a genuine local driveways, building and landscapes contractor. For free no obligation advice or a no obligation quotation please feel free to contact us.